man wasn't charged until September 6, 2000. The blood test results were available May 3, 2000. They showed negative for alcohol and the drugs they tested for. During the five months of "investigation", we were in touch with the police often and assured they were making certain they had all the information in order to charge the man with the proper violations of the law. The arrest warrant said "homicide by vehicle 2nd degree" and "failure to yield at an intersection." We trusted the police on their word that they would do a thorough investigation. BIG MISTAKE!!! Not that it would have made a difference in the charges, which as I said is a misdemeanor and only carries a $1,000 fine and up to a year in jail. But, it would have answered many of our questions. We have since found out that there are independent investigators that can use computer programs and engineering principles to determine such thing as speed during impact. Also, many of the newer vehicles have electronic chips in them to advise as to whether the brakes were engaged and how fast it was traveling at time of impact, kind of like "the black box" on an airplane. solicitor for the county. We sat and talked about our Jessica and the events of that fatal day. We were impressed by the concern and professionalism of them both. Stephen has since been promoted to the district attorney's office and now works on felony cases. The court we were in only heard misdemeanors and would have a jury of six. We were told that the man would probably ask for a jury case since there had never been a conviction of this type in our county where a jury was involved. These were just unfortunate "accidents." We provided all the information we had gathered to Stephen and Aubrey. The man had hired a local attorney to defend him. he did not have funds or other insurance to cover the expenses. During the investigation, we found the man divorced his wife in October 2001, then in the same month, married the lady he was talking to on the phone! He had two children by his former wife. Also super model Niki Taylor was injured in a cell phone related accident April 2001 and there was a new awareness created. 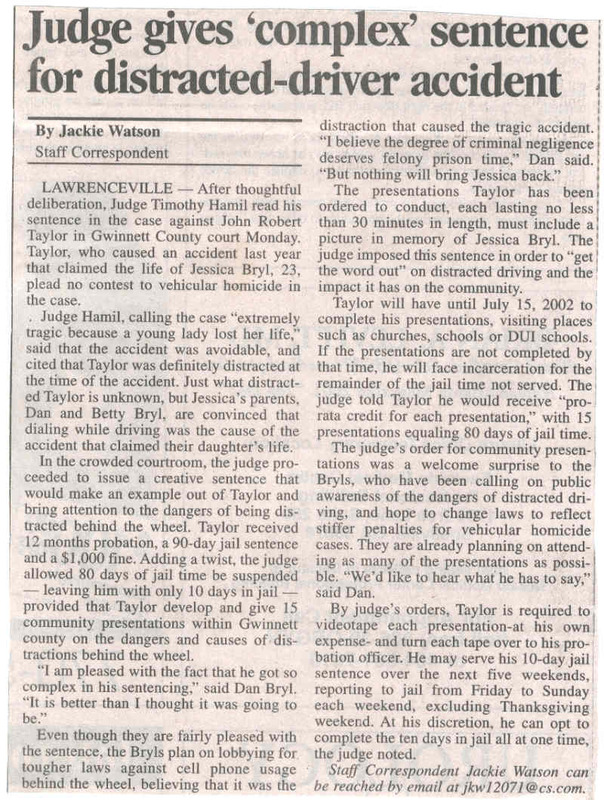 Then Gwinnett County got it's first conviction. So the man's lawyer decided not to go with a jury trial, considering there were many witnesses that said Jessica did everything right. Their stories differed from the man's version in quite a few important points. Cell phone records coupled with the man's statement through his lawyer proved the phone was involved. The man denied being on the phone at the time of the accident and claimed he didn't know he was supposed to stop on a four way flashing red light. "Man pleads no contest in vehicular homicide"
During testimony, the man admitted he was going to be late for a class he was training at 8:00am that morning. At the intersection, he was more than twenty minutes away at the time of the accident which was about 7:45am. He was calling a co-worker at her home. Nothing will bring our Jessica back or fill the void that losing her has created. This Earth has lost a true friend, and Heaven has gained a shining Angel! 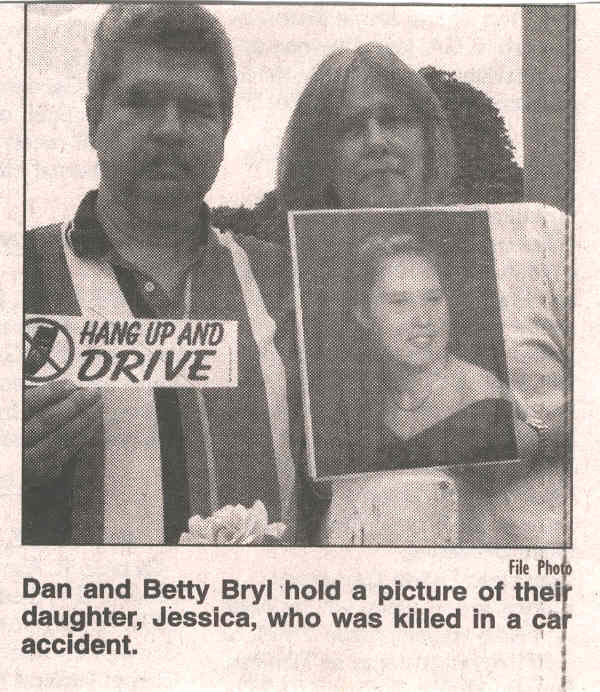 In Jessica's memory, we will continue to tell her story and attempt to let people know that a phone call is not worth the taking of a life or the pain and suffering that an auto injury can cause. Ask Niki Taylor, I'm sure she would agree.